Now streaming on Netflix, Illang: The Wolf Brigade is the new cinema live-action remake of the 1999 anime Jin-roh: The Wolf Brigade. The original will be released shortly by Anime Limited, and there’s a certain neatness to a remake appearing now. The anime Jin-roh was a successor to Ghost in the Shell, made a few years previously by the same studio and many of the same artists. The live-action Illang came out in 2018, barely a year after Hollywood’s Ghost with Scarlett Johansson. Like the Ghost remake, Illang plays up the action spectacle at the expense of the original’s brooding poetry, and it’s another strange mix of slavishly recreated moments and outrageous story liberties. The chief difference is that Illang isn’t an American remake. 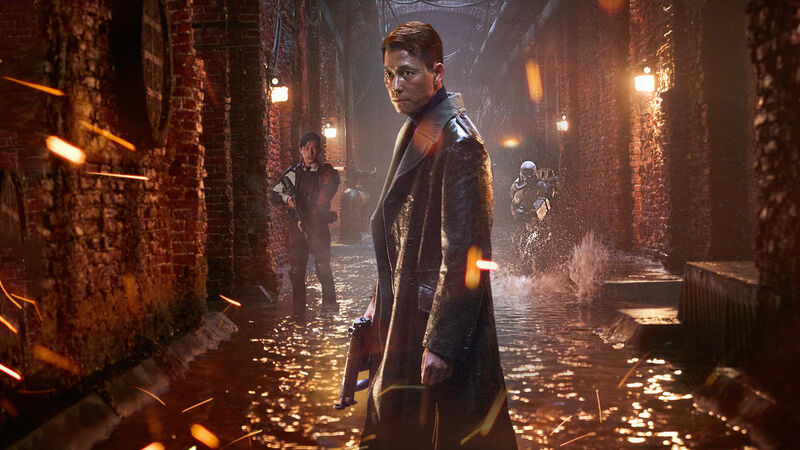 Released in South Korean cinemas last July, it transposes the story from Jin-roh’s alternate-history Japan, circa 1950, to South Korea in the near future. Backstory aside, the first scenes match the anime closely. An armoured soldier, fighting a violent urban insurrection, comes upon a young girl fleeing through the sewers. Cornered and terrified, the girl detonates the explosives she’s carrying, blowing up before his eyes. Later, the soldier meets the dead girl’s civilian sister, and is drawn to her, but ruthless factions are manipulating events, and even love isn’t guileless. Illang is directed by Kim Jee-woon, best-known in the West for his 2003 psycho-horror A Tale of Two Sisters. A decade later, his Hollywood debut was a true oddity, a small Arnold Schwarzenegger action film called The Last Stand. Kim also co-wrote Illang’s screenplay, which starts much like Jin-roh with several minutes of voice-over exposition and overlapping images. 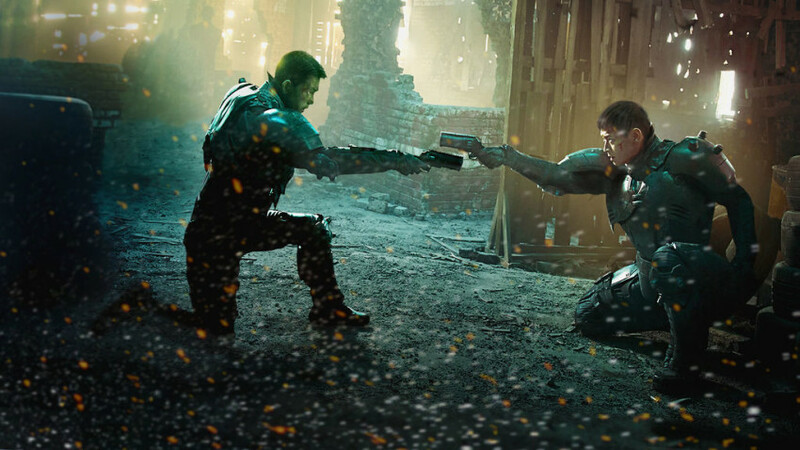 However, it feels different by virtue of describing a near-future scenario – the main action takes place in 2029 – as opposed to an alternate history. Illang’s scenario involves global tensions – South and North Korea trying to reunify for survival, and threats from China, America, Russia and Japan. It feels like a South Korean answer to the 1984 invasion-America film Red Dawn, or to the North-Korea-invades-Japan novel From the Fatherland with Love. After the prologue, Illang’s opening set-piece meticulously mirrors the anime, sometimes shot-for-shot. The irony, of course, is that Jin-roh, like other anime by its cluster of artists (Patlabor 2, Ghost in the Shell), simulated live-action to levels astonishing for drawn animation, with a cinematic melancholia antithetical to the slick surfaces of motion capture. This soulfulness is lost in the Illang opening, which is impressively mounted, but intrusively so, down to a self-conscious ploy in one shot of lifting a camera overhead to try convincing us we’re seeing a city-wide riot, not a load of actors, sets and CG extensions. Again, while the action in Illang’s overture is strong, it’s notable that the film stumbles at the first crescendo, the soldier’s encounter with the girl bomber. In the anime, it’s taut, terrifying, intimate and sexual. In the remake, the moment’s practically ruined by indifferent lighting, surplus action and the schmaltzy addition of a tear. After that, Illang continues shadowing the anime for a while. A new character shows up, a woman called Lee, who’s the dead girl’s sister. The soldier who saw the girl die is identified as Im. They’re played by Gang Dong-won and Han Hyo-joo, who are both well-established in South Korean cinema and television. Both actors are in their thirties, so the age-gap element in the anime is less pronounced here. In the original Jin-roh, the woman was called Kei while the soldier was Fuse – a name made up of the Japanese characters for “man” and “dog”, equivalent to “Illang” in Korean. True to the anime, the woman Lee says she doesn’t blame Im for her sister’s death, and the two become a platonic couple. Lee runs a second-hand bookstore, where she tells Im a downbeat version of Red Riding Hood, about a girl inexorably trapped and devoured by a beast. In the anime, the story was narrated over scenes of the characters’ daily lives. Instead, Illang tells the story over a succession of classically-styled Grimm images, while playing the anime’s theme song, the Celtic-sounding “Grace Omega.” It’s an overt hat-tip to Illang’s anime source – indeed, the brief segment was guest-directed by Mamoru Oshii, the writer of Jin-roh and director of Ghost in the Shell. Yet the interlude misses the point of Jin-roh treating anime as live-action. It’s around this point – about 45 minutes into the film – that Illang truly diverges from Jin-roh. The outline of the story stays recognisable – frankly it might have been more interesting if it had diverged further – but Illang throws in backstories, new characters and epic action set-pieces. Not only weren’t they present in the anime, they run against what the anime was doing. Which, in itself, is fine. It’s a point that shouldn’t have to be made, but it seems to need shouting in 2019, especially when discussing adaptations of anime. So let’s shout: an adaptation is under no obligation, moral or aesthetic, to “respect” its source. Kubrick’s Shining didn’t; nor did James Whale’s Frankenstein or Disney’s cartoon Jungle Book, nor, in anime, Mahiro Maeda’s “de-Christianised” version of The Count of Monte Cristo. It’s just that Illang’s particular adaptation fails, blowing up a 101-minute film into an unwieldy 140 minutes without starting to gel. The spare plotting and elongated action detract from Im and Lee’s story without weaving any larger tapestry. Take the “bad guy,” played in Illang by Kim Moo-yul. In the original anime, the adversary character, such as he was, took Jin-roh and its “hero” into deeper shades of gray. Illang’s equiavalent character? A manic sadist-torturer. Another Illang character has added backstory, committing a bloody double shooting in a new-invented flashback. By the end we’re asked us to see this character as somehow more innocent than the film’s other murderous dramatis personae. In the anime, the equivalent character’s past acts were left in shadow, along with questions of guilt or innocence. As for Im, the protagonist, he becomes the centre of hardboiled action scenes. One of them has him efficiently snapping the neck of a woman enemy agent during battle, perhaps to say this is grittier than James Bond. But that’s still what much of the new action resembles, especially with the use of Seoul’s Namsan tower as a conveniently monumental backdrop. It feels especially ironic given the source. Jin-roh, after all, was scripted by Mamoru Oshii, who actually subtracts action from his anime (Ghost in the Shell, Patlabor, The Sky Crawlers). He distances it, cuts away from it, more than he ever shows it. True, Jin-roh was an Oshii “adaptation” too – the actual director of the anime was Hiroyuki Okiura, Oshii’s protégé. But rather than add action, Okiura changed Oshii’s script to fortify the film’s central relationship, with the action mostly book-ending the film. In pushing vast new set-pieces into the remake’s middle act, Illang director Kim relegates the love-story to a sideshow, as crudely as if Vertigo – one of Jin-roh’s referents – was remade today with a fifteen-minute long shoot-out. Illang’s worst moment of dysfunctional adapting is toward the end. Heading back towards the anime script, there’s a revelation about the hero’s inner monstrousness. That meant something in the anime, where the character had hardly used any violence up to that point. In Illang, it comes after the neck-snap and dozens of other brutal killings by Im, which makes the moment laughably redundant. 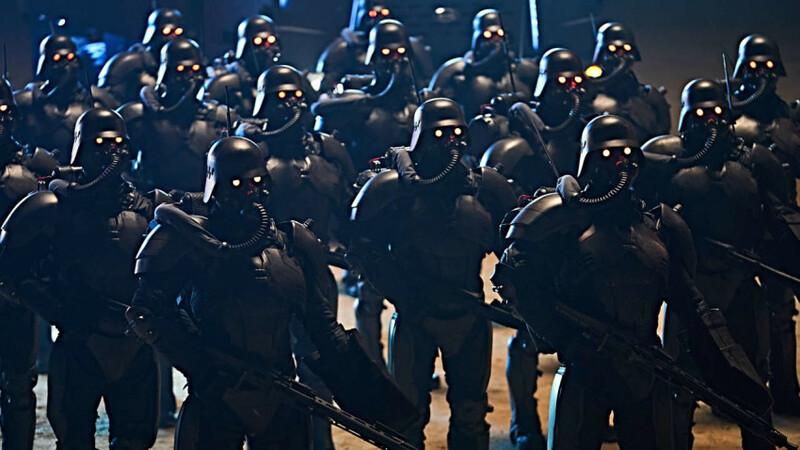 So, by this point, is Jin-roh’s iconic body armour, whose dehumanizing look only makes the last action scenes the dullest in the film. There’s nothing especially incompetent about Illang, but it’s perversely baggy and outblown, pouring spurious action and business onto the anime’s compact story. The few scenes which do foreground Im’s and Lee’s relationship are competent, even touching at times. Even their lack of “chemistry” fits a story whose players are anonymous; even in their love story, they’re relating to each other as ciphers and symbols. Of course, that’s the ethos of a huge amount of anime, the original Jin-roh included. There’s one way in which Illang differs fundamentally from Jin-roh. However, it can’t be discussed without spoiling the entire film; it’s also not worth knowing if you haven’t seen the anime. Readers who still want to know should scroll highlight the white space below. SPOILERS INSIDE: In brief – Illang has a happy end. Anyone who knows Jin-roh, and how devastating the original end was, can’t help but be outraged. For anime fans, Illang’s ending should rank down there with Hollywood’s remake of The Vanishing, yet it sets an amusing precedent. At last, a live-action film which gives a “Disneyfied” ending to a downbeat animated film! Like the Vanishing remake, Illang recreates the denouement of the original film almost exactly, then zags at the last moment – perhaps to wrong-foot the section of the audience who’d seen the Jin-roh anime and were expecting it to match up. Aesthetically, it feels mostly worthless, a sap to the audience members who’d not seen Jin-roh and might have complained at a downer. There’s a vague suggestion of hokey political symbolism in the closing moments, but given the film hardly pretends to discuss politics at that level, it just adds another layer of spuriousness to a film encrusted with them. Illang is currently streaming on Netflix. Jin-roh, the anime, will be released later in the year by Anime Limited.